Arianespace’s fourth Ariane 5 flight of 2016 has been given the “green light” for liftoff on Wednesday following today’s successful launch readiness review, which was conducted at the Spaceport in French Guiana. This milestone – held prior to each Arianespace mission from the near-equatorial launch base – confirms the heavy-lift vehicle and its dual-satellite payload are flight-ready, along with the Spaceport’s infrastructure and the network of downrange tracking stations. The approval also clears Ariane 5 for tomorrow’s rollout from the Final Assembly Building to the ELA-3 launch zone, where it is scheduled for liftoff on August 24 during a 45-minute launch window opening at 6:55 p.m. local time in French Guiana. 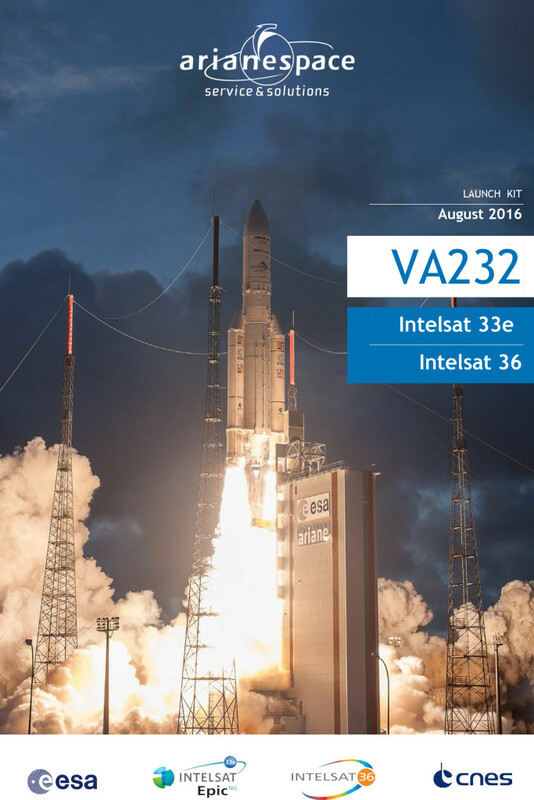 Designated Flight VA232 in Arianespace’s numbering system, this week’s mission has an estimated payload lift performance of 10,735 kg. – a total that factors in the two satellite passengers, Intelsat 33e and Intelsat 36, plus the SYLDA dispenser system and integration hardware. Intelsat 33e is to be deployed first during the 41-minute flight sequence and will operate from an orbital position of 60 deg. East. Built by Boeing using a 702MP spacecraft platform, it is the second satellite in Intelsat’s next-generation high-throughput Intelsat EpicNG series – joining Intelsat 29e, which was launched by Arianespace aboard another Ariane 5 in January. Installed in the lower payload position, Intelsat 36 will be the second passenger released by Ariane 5. It was manufactured by SSL (Space Systems Loral) based on the company’s 1300 platform, and will operate from the 68.5 deg. East orbital position – where Intelsat 36 will be co-located with the Intelsat 20 satellite launched by Arianespace in August 2012.